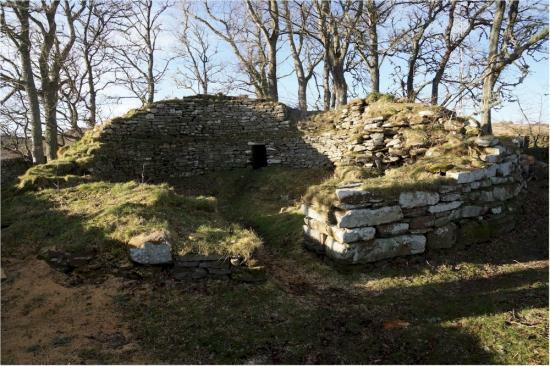 An award of £21,014 from the Highland LEADER Programme is the last piece of the financial jigsaw required for a project which aims to conserve Dunbeath Broch in Caithness. Neil Buchanan, Chair of Berriedale & Dunbeath Community Council said: "Dunbeath Strath provides a walk with a variety of interest and is popular with local people, the wider Caithness community and visitors to the area. The Strath is sheltered, picturesque, has a long and impressive history of human settlement and is rich in archaeological sites. The best known of these are brochs - tall imposing circular drystone towers built over 2000 years ago - some of the most remarkable structures ever built in Britain. Despite this richness very few Caithness brochs have been subject to modern excavation and dating and few are readily accessible or adequately presented. "Dunbeath Broch is a Scheduled Monument and is the best preserved and most visited of several brochs in the Strath. However, the broch is in need of conservation works to slow or prevent deterioration of the structure and assure safe access. LEADER funding will allow us to undertake these works in partnership with a professional archaeological and conservation team. The conservation and investigative works will also form the basis for an outreach programme for local schools and the community." The Caithness Local Area Partnership is encouraging potential applicants in Caithness to come forward for a share of the funds still available from the Highland LEADER Programme. Debbie Gray, Chair of the Local Area Partnership said: "LEADER aims to promote economic and community development within rural areas and is a great source of match-funding to enable a wide range of projects to be delivered. Applicants are able to apply for funding of up to 90% of project costs. "LEADER funds must be committed by March 2019 with projects completed by October 2019. We would encourage as many projects as possible to come forward to benefit from EU funds whilst they are still available. With funding allocated on a first come, first served basis now is the time for groups to get in touch to find out how LEADER can help."